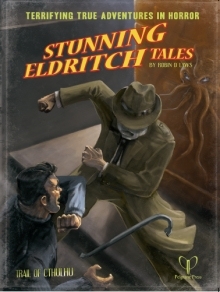 The first supplement for Trail of Cthulhu this book has four new adventures written by Rodin D Laws. These pulp-style adventures are a good companion for the core book, helping folks get started with the Gumshoe system from Pelgrane Press. The book itself is 82 pages (including the handouts) and has a cover by the talented Jerome Huguenin. 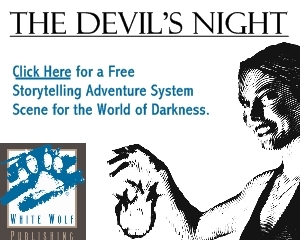 Most of the book’s layout is a three-column format with occasional sidebars and dark black-n-white images that show off some of the scenes for each adventure. On with the adventures…One of the things I’m going to try to avoid in this review is revealing too many details about the adventures and the mysteries within them. That way, folks will still be surprised when they get the chance to play along. Hopefully I’ll still be able to provide enough information to let you know how useful the book is and whether or it will add to your Trail of Cthulhu game. The Devourers in the Mist: A rugged adventure tale in which the survival of island castaways is tested not only by the elements — but by the twisted shapes of half-seen, sadistic entities who haunt the atoll’s jungled interior! This adventure also includes several pre-generated characters, which are primarily built for convention play. If someone was going to include this adventure in an ongoing story I would assume the players would already have characters of their own. Shanghai Bullets: Guns-blazing danger portends and international intrigue unfurls in the city of conspiracy, the licentious, opium-infused Berlin of the East. In the shadow struggle between nations, no weapon is more fiercely coveted than the star mirror. It brings blood-draining death from beyond the stars! This adventure offers up a bit more investigative mystery and some great setting material detailing the streets of Shanghai. The setting material is extensive and it contains a ton of useful ideas to explore even if you don’t want to run the adventure as-is. Information on local currency, politics, languages in use at the time and a few interesting local characters are all provided in this adventure. The new Rule “The Drop” offers a way for characters to gain an advantage over others with surprise tactics. Inspired by gangster movies and dramatic fight scenes, The Drop is useful for facing down enemies and keeping them at bay for important dialogue scenes. Death Laughs Last: When philanthropist and gadabout Addison Bright is found bizarrely murdered in his own New York mansion, only a team of doughty investigators can protect his reputation—and the sanity of mankind—from the awful truths lurking in his tragically colorful past. Masked vigilantes and secret conspiracies are the norm in this adventure. 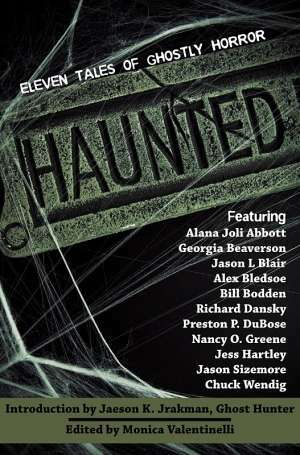 There is plenty of horror, but this is a pulp-investigation story first. Plenty of interviews to conduct and a lot of misdirection to get caught up in. I didn’t like this adventure much at first, masked heroes? really? However, once you get into the conspiracy elements it gets creepy fast. It is definitely a good horror story. Dimension Y: A scientific experiment yields the promise of a glimpse into an adjoining reality, a repository of man’s dreams and memories. But when the heroes peer through this window… they find cosmic horror peering back at them! This adventure blends a bit science with elements of the occult and plenty of investigation. The characters are on a time limit to solve the mystery as well since they could very well be affected by the event that unfolds at the beginning of the story. I probably won’t use this adventure as-is, but there are plenty of cool ideas and some useful information that is definitely worth reading. The sidebar on “Ticking Clock” scenarios is a great read, providing ideas on pacing and moving the plot along to keep the tension high in the game. There are some handouts in the back of the book, but they seem rather dark and difficult to read. Luckily, the folks at Pelgrane Press have made them available for download on the Trail of Cthulhu Resources page. Like any book of published scenarios this collection is a mix of useful information and clever ideas. They may not work as-is for everyone’s game (not everyone enjoys pre-made adventures), but there is still enough information provided to make the book a worthwhile addition to your Trail of Cthulhu collection. Look for more Gumshoe System RPGs at Noble Knight Games.